For this month's taste & create event, I was paired up with HoneyB, keeper of the blog "The lives and loves of Grumpy's Honeybunch." Looking through her blog, I was pretty sure I would be making muffins, as that seems to be HoneyB's "thing." But then I saw it. 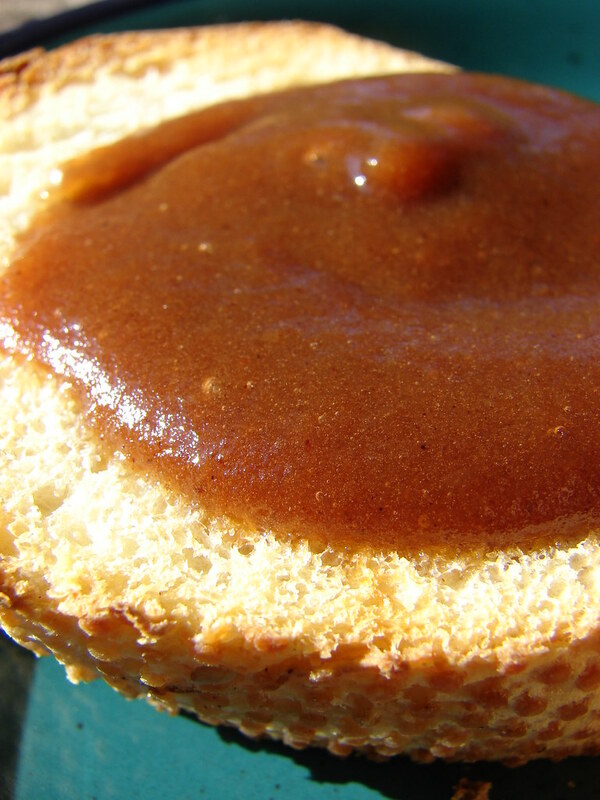 Apple Butter. Growing up I loved apple butter something fierce, but as an adult I rarely think of looking for some, let alone making some. Nostalgia, the coolness of autumn and my love for anything crockpot told me I had to try this slow-cooker apple butter. I am so happy I did. For one thing, this will make your house smell fantastic...that kind of fall, spicy, sweet warm smell that makes everything okay. Also, it tastes great. I, like HoneyB, love my sweets to have a kick, so I followed her advice and doubles the amount of spices. I changed the cooking times a bit...it cooked on high for about 3 hours, then I turned it to low and went to bed, so it cooked another 6 or 7 hours while I slept. In the morning, I let the cooked apples cool a bit, and put them in the fridge because I had to go to work. After work, I came home and used a hand blender to make the mixture into a smooth butter. Mine's a little thin. I think another hour or so without the lid on may have helped it thicken up. But I don't mind the thinner apple butter, and it tastes sooooo good. It tastes happy. and yes, that is bacon on that toast with the apple butter in the first photo. so what? It's also quite amazing warmed up and poured over vanilla ice cream. mix all the ingredients together and cook them in a crockpot on high for 3 hours. Turn the temp to low and continue cooking another 6-8 hours. Blend until smooth with a hand blender. 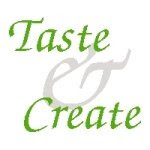 Go check out HoneyB's taste & create post, where she made my bacon-wrapped shrimp. I love the bacon, toast, and apple butter!! Yumm! What a smart idea! This sounds really tasty. This looks great! What kind of apples did you use for this? 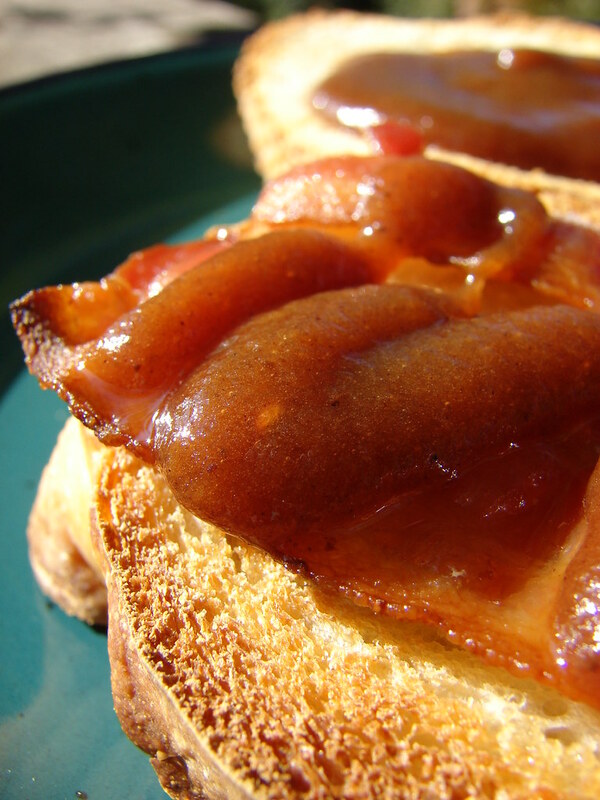 Mmm...toast with bacon and apple butter. I was planning on making apple butter in the crock pot with a different recipe, but this one sounds so much better. I love the idea of using brown sugar. I'm searching for some way to use up all the apples I picked this weekend and I think this may be it! Do you think this would work with pumpkin for pumpkin butter? Apple Butter and Bacon, two of my favorite things. potato chips in the microwave?!? !